Other photos: Photo 1, Photo 2, Photo 3, Photo 4, Photo 5, Photo 6, Photo 7, Photo 8, Photo 9, Photo 10, Photo 11, Photo 12, Photo 13, Photo 14, Photo 15, Photo 16, Photo 17, Photo 18, Photo 19, Photo 20, Photo 21, Photo 22, Photo 23, Photo 24, Photo 25, Photo 26, Photo 27, Photo 28, Photo 29, Photo 30, Photo 31, Photo 32, Photo 33, Photo 34, Photo 35, Photo 36, Photo 37, Photo 38, Photo 39, Photo 40, Photo 41, Photo 42, Photo 43, Photo 44, Photo 45, Photo 46, Photo 47, Photo 48, Photo 49, Photo 50, Photo 51, Photo 52, Photo 53, Photo 54, Photo 55, Photo 56, Photo 57, Manufacturer Provided Image. All Freshwater, low hours (725). Fully loaded and ready for new owners. All serviced and in turn key condition. One of Cruisers best models ever. Huge cockpit, spacious salon, tons of galley storage, and two staterooms with heads!! Call Today!! SYS Yacht Sales is pleased to assist you in the purchase of this vessel. 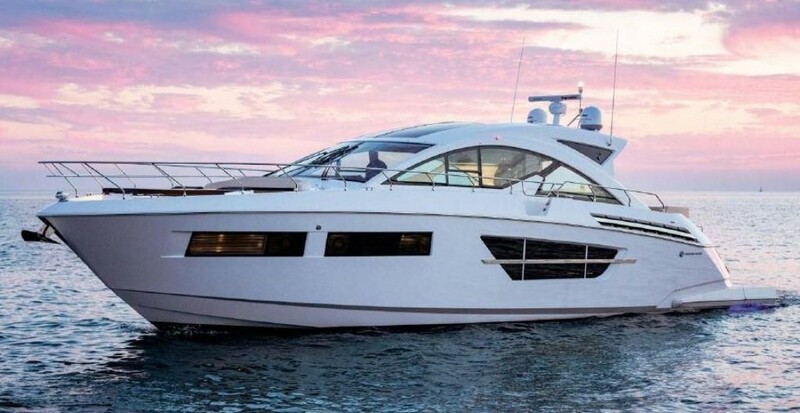 This boat is centrally listed by Wheeler Yacht Sales.